Brömersburg. Image Credit: Caleb Lemke. The ruby along the Rhine River. Even after half a dozen times, Rüdesheim's charm keeps drawing me back, time after time. It lies along the banks of the Rhine River, in the German state of Hesse, not far from Mainz and Frankfurt. The region is considered to be prime German wine areas, a bastion for German Riesling and others. Rüdesheim is considered to be the focal point for the local wine industry, as well as for the "wine tourism" in the region. 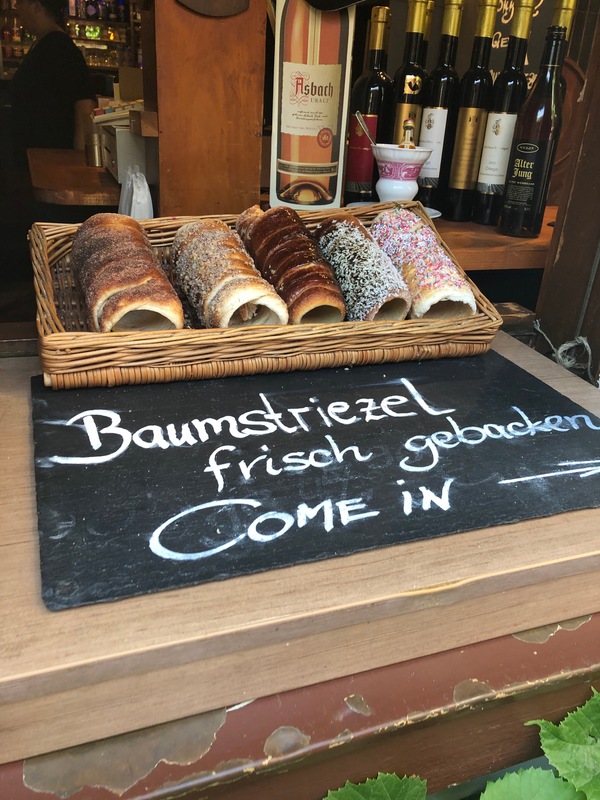 With its profile on the rise, the village has begun to attract visitors from, not just inside Germany, but from across Europe and the rest of the world. Who wouldn’t want to visit the small, old fashioned German village? 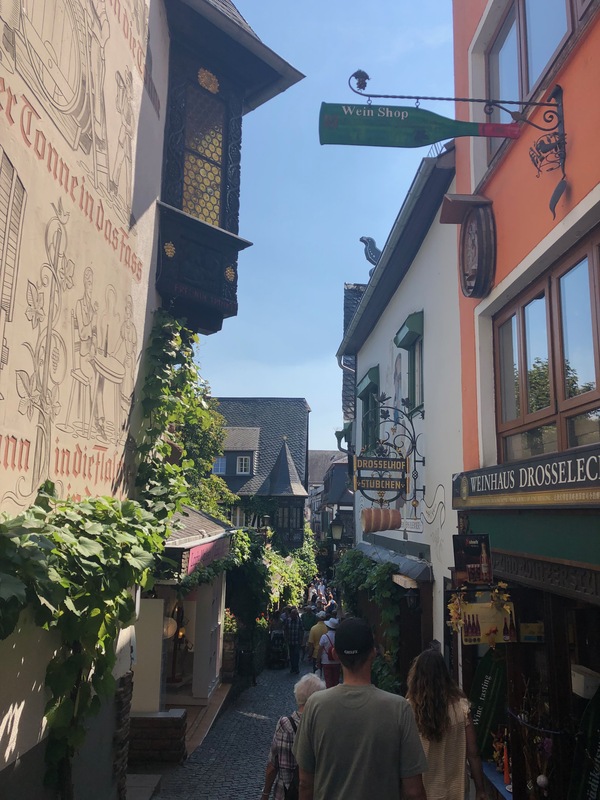 With small streets just for pedestrians, old German architecture and stunning surroundings, Rüdesheim is a beautiful little piece of Germany, and a nice weekend getaway from Paris. While there are great views from the village itself, the best views are just outside of Rüdesheim. Tiny, two-person open-air cable cars take you, over several vineyards, up the hill on which Rüdesheim is situated. On a clear day, the ride is stunning and makes for beautiful views of the village, the river and the rolling green vineyards. If you are traveling solo, you'll wind up taking the cable car ride with a stranger. Just you and a sixty-two year old man named Jürgen, knee to knee, sitting in silence fifty feet in the air for the fifteen-minute ride over romantic vineyards. At the top of the hill there is a popular and pristine hiking area, which is also accessible by foot from Rüdesheim. Though be warned, it's a bit of a steep walk. Within the hiking area is the semi-famous Niederwalddenkmal, a giant monument dedicated to German Unification, dating from the 1870s and 1880s. There is a small restaurant and rest area near the monument. While the monument doesn't give you a clear view of Rüdesheim, you do have a magnificent view of the Rhine River Valley and its rolling vineyards. Besides the vineyards and good views, Rüdesheim boasts its own UNESCO World Heritage site, Brömserburg, a small and ancient stone castle which now functions as a wine museum. Further along the previously mentioned hiking path, there is the Ehrenfels Castle, an ancient castle which lends its name to a variety of grape used in the production of wine. To enter the castle you'll have to prearrange a tour. This area of the Rhine River has a castle every few miles, historically built to tax the passing ships. If you are craving to see more castles, there are a dozen more to see. There are Rhine River cruises which let tourists visit and see many of the castles that are open to the public, Rüdesheim being one of the most popular stops on these cruises. Drosselgasse is one of the top draws for Rüdesheim, and it is easy to understand why. While the majority of the village consists of small, narrow alleyways, Drosselgasse is smaller than most. The alley seems perpetually packed, and at some of the tighter spaces you're reduced to single-file lines. There are several wonderful little restaurants and eateries along the alley. A must-go-to is the Eis (ice cream) and cake shop at the bottom of the alley, which has excellent Spaghetti Eis and Black Forest cake. There is also fantastic little eatery, Drosselhof Stübchen, a tiny place specializing in Baumstriezel. These are little baked, sweet bread spirals, essentially chimney cakes like the Hungarian treat, which are cooked on a rotating wooden spit. Now most are cooked over electric heat sources, but the ones cooked over wood fires are still superior. They’re covered in a small layer of butter and covered in your choice of toppings. While there are a plethora of candy toppings, the classic cinnamon and sugar one is one the best. You can find Baumstriezel at many German Christmas Markets. There’s a specific local drink, unique to Rüdesheim, which is a must-try when visiting. Rüdesheimer Kaffee is very hard to find outside the little village's few restaurants. The drink is difficult to reproduce, as it involves the local brandy, Asbach, and the use of fire. Each cup of Rüdesheimer Kaffee is prepared freshly in front of you. The process starts by lighting the Asbach, which is soaked in sugar, on fire. The sugar is burned to liquid before dropping it, still lit, into the rest of the brandy in the cup. The cup is allowed to burn for a few seconds in order to remove some of the alcohol, before the hot coffee is added to the mixture, which puts out the fire. The Rüdesheimer Kaffee is stirred together before topping it off with whipped cream and chocolate sprinkles. This is the last step, with the cooler whipped cream mitigating the heat of the recently-on-fire-drink. The sweetness of the cream and chocolate, the bitter tinge of the coffee, and the underlying taste of the brandy make Rüdesheimer Kaffee a fantastic treat. While the town is great to visit at almost any time of the year, the prime time to see Rüdesheim is during one of their celebrations. The annual Wine Festival, held in mid-August, is a beautiful time in the area. Wine Festivals are, in general, quite common in the area in the summer, but Rüdesheim’s is by far the best. 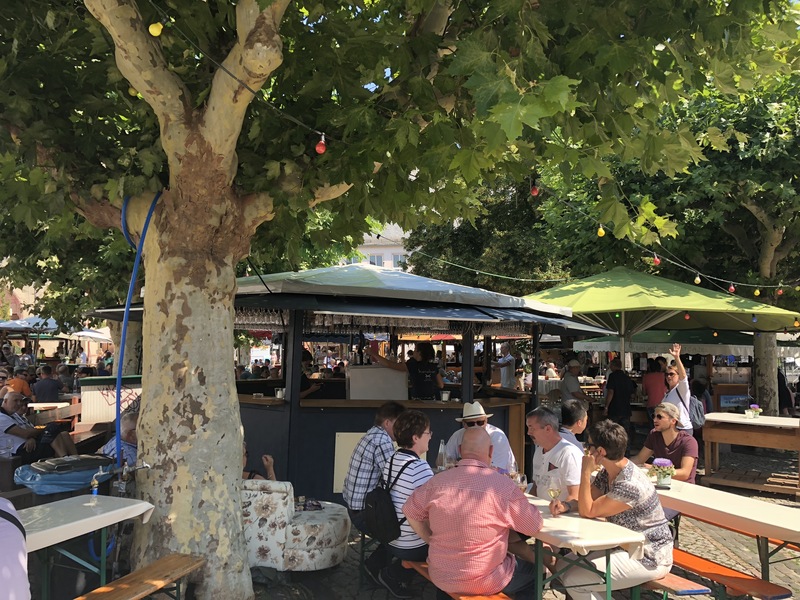 Stalls from various vineyards in the area are opened throughout the streets and in the central plaza, allowing you to stop and try dozens of different kinds of wines, which are sold by the glass or by the bottle. Aside from the wine vendors, there’s the usual set of food trucks and stalls, such as ones that sell Flammkücken, or Würst. The only way to end a great summer of traveling is sitting in the open plaza during the Wine Festival, nursing one of the local wines in the pleasant sunshine. Caleb was born with an insatiable wanderlust and a love for learning new things. An International and Comparative Politics major, he hopes to spend his career globetrotting.